Have you ever wished you had personal, day-by-day guidance on your journey to vegan? Are you wanting to make the transition but fear going it alone? 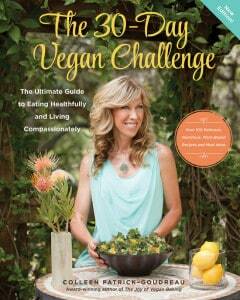 Do you want practical tools and structured directions for going vegan and staying that way? How about the compassionate guidance from an experienced vegan? Well, today is your chance to not only hear from such a force in the vegan movement, but also win a copy of her all-inclusive guide to going vegan, The 30 Day Vegan Challenge. Join me and Colleen Patrick-Goudreau and enter for your chance to win. Today I’m honored to bring you an interview with Colleen Patrick-Goudreau, who is a powerful and compassionate voice for the animals. She is the author of seven books, including the brand new 30 Day Vegan Challenge, a gifted speaker, podcaster, and more recently, YouTuber. For those just beginning their vegan journey or even old hats like me, Colleen has a way of making veganism incredibly approachable. For the rest of colleen's awesome answers, check out the video and then enter below for your chance to win a copy of colleen's The 30 Day Vegan Challenge! you have until next Thursday, January 22nd, so get on it! Winners will be announced on the Bite Size Vegan Facebook page and will be alerted by email. Best of luck and see you next nugget! Switching to vegan was much easier when we moved to Portland, so that gave me the confidence to commit to trying it. We were vegetarian for a couple years, so that helped as well, since we were halfway there. It also helped that the selections when eating out are very plentiful where we live. I wasn’t a huge fan of fruits and vegetables, so that was a concern that I wouldn’t find enough to eat and fill me up. Salads don’t work for me, I’m still starving afterwards. I’m always looking for fake meats and vegan cheese options, so I can eat the same food I used to, but without the guilt. The grocery stores are carrying many more options, but you might still have to seek out a local co-op for a wider selection. The hardest part was the planning. Once I learned to be prepared when I don’t have control of the food options (parties, events, travel), and I learned which items are actually vegan, it’s now pretty easy to do. My co-workers (whom I eat out with most days) are very supportive as well, and that has helped quite a bit. The first couple weeks were difficult, but now I’ve got the foods and places to eat figured out. I also used an app called “Is it vegan?” which helped me double-check myself. thanks so much for sharing your experience Brion! sounds like you’ve got a system in place now- that’s excellent. The hardest part about being vegan is dealing with the ignorance and stupidity of people. Its shocking how cold people can be and how well built their walls that surround them are. Its hard to know that if they would just open their eyes, they would realize and understand. And they know this, That’s why they don’t do it. i certainly feel you there Nina. The main thing that had made the switch hard for me was social reasons. Society does not react well to vegetarians, much less vegans. People get offended just at the sound of the world. I’ve heard people go on and onabout how they hate vegans and how stupid they are and so on. The food part was easy. very true Kim. that can be such a challenging aspect of going vegan- probably the most challenging! great point. When I finish my exams, I’ll finish to translate the “Vegan answers to common questions and objections”, if I get any of these free ebooks, I’ll try to do the same with this one :) Everyone should be able to enjoy of this kind of books (I also recommend ‘Veganomicon’, by Isa Chandra Moskowtiz and Terry Hope Romero, two friends bought it to me and I’m really enjoying it, it’s very cool). The good side of being vegan it’s, actually, this community, everybody helps each other and everybody share their tricks and stories. I’m really enjoying going vegan, it’s amazing. PD: Anybody who needs any kind of help or just want to discover more vegan people is welcome to join us on http://www.reddit.com/r/vegan (not spam, it’s not even close my website (I wish it would), but it really helped me with everything and I’ve discovered great people and cool stories and news). It’s fantastic to see you two lovely ladies come together. I actually consider both of you mentors who I go to when I have questions, though you’ve probably never heard of me! Haha! I watch both your videos for resources which help empower me to talk about veganism with carnists and vegetarians (or I should say pre-vegans) all the while teaching me how to stay calm and civil when discussing this heated topic with people who just don’t understand yet. Thank you both for you dedication to the movement and creating strong positive platforms that have reached so many. Somos veganos fuertes! I am ecstatic to see you connecting with Colleen! I really love that her book is still a great resource for people who have already gone vegan — especially when so many (unfortunately) switch right back to carnism. Thanks for providing such inspiring, quality content, Emily! I already have the book,both versions,so I’m hoping to win this to give to a relative as a gift of health.